When the news arrived April 21, 2016 that Prince Rogers Nelson had died, the world began its mourning for the music superstar who made his mark in so many ways- as a gifted musician, prolific composer, best-selling recording artist, singular performer, bold tastemaker, inspired mentor and generous philanthropist. Yet perhaps nowhere was his loss as heartfelt as in and around Minneapolis, his hometown and lifetime haunts. A year and a half later, fans continue to pay homage by retracing steps of The Purple One at some of the well-known Minnesota spots he put on the map, including Minneapolis nightclub First Ave. and his home/recording studio Paisley Park in nearby Chanhassen. Less well-known, but no less significant a landmark in Prince’s life is 430 Oak Grove, a KA property which recently was recognized for its role in launching Prince’s early career. Located on the south edge of picturesque Loring Park in Minneapolis, the stately building was first constructed by Kraus-Anderson in the 1920s, originally serving as an office for Northwestern National Life Insurance. After the original owner moved on in the early 1960s, the building was converted to multi-tenant use, hiding much of its original luster under drywall and bland paint and carpeting. The aging building continued a slow decline until, in 2011-2012, Kraus-Anderson purchased and redeveloped it into luxury apartments while conserving its historic architecture and design elements. Despite the preservation of original features such as windows, marble, skylights and a lobby mural, perhaps its greatest historical significance is as the site of the first known musical recordings by Prince recorded when he was just 19. 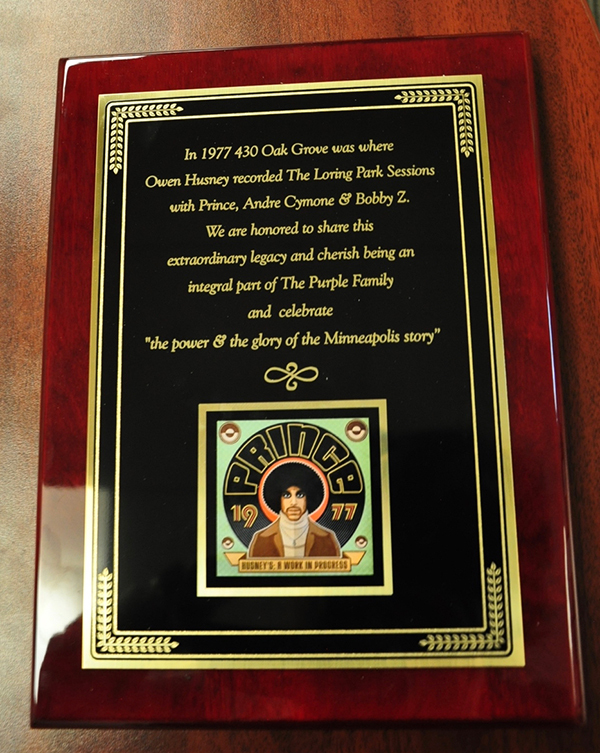 In 1977, a year before the release of his first album, Prince recorded “The Loring Park Sessions” in the studios of Owen Husney, his first manager, who was then a tenant at the building. Joining Prince on those historic sessions were his childhood friend Andre Cymone on bass, and Bobby Z. on drums. Together they recorded eight instrumental songs blending funk, disco, R&B and jazz. Bobby Z would go on to join Prince’s band, The Revolution. The Loring Park Sessions, never released, grew to legendary status over the years. At this writing, Husney has digitized the material and release is pending. The plaque has been installed on the wall near StuartCo.’s office, and is nearby inscribed with the signatures of Husney and Cymone. In purple marker, of course. So sweet. Fitting that you sent this on Yom Kippur Owen. I’m actually at Temple Israel right now taking a break. Remembering Prince on this day is special.